The young man, far too young to behold such a sight, reaches down to his left to grab a pine branch that looks new when compared to the man-relic on the wet ground before him. “You’re not going to poke him, are you?” The girl pleads. He cracks open the cover and flips through hundreds of pages of long-form content until he reaches white space, at which point he backtracks to the last entry. Not wanting to be accused of disturbing the scene of a potential crime, the boy returns the book to its rightful owner. But, just as he drops the man’s heavy arm back over the book’s cover, the corpse springs to life, and the young duo shriek in terror as they run back from whence they came. I’ve been on a ketogenic diet since my 33rd Birthday in March. I’ve lost 21 pounds and I feel great. I was recently promoted at my job. We went to Cancun for a week in February (the whole family) and are headed to Puerto Rico in August for another week (again, the whole family). Both of these trips (Airfare and Hotel) were/are free thanks to Credit Cards. After much discussion and planning, my wife and I are basically dead-set on retiring in the summer of 2021 and moving to Arizona (I’ll have just turned 36 at that time). From here on out, I’ll stick to the financial aspects of the last nine months. There are two elements which are of particular importance. I became bored with investing as my portfolio became unwieldy and complex, leading to an inability to maintain an expertise over my companies. I had been matching, or even trailing, index performances for several years. I owned far too many stocks where I had little conviction, and eschewed owning far too many stocks where I had significant conviction. (Extension of 3) Due to the fact of owning so many stocks (around 65 positions), each position size was pathetically small compared to my total portfolio (typically less than 1/5th of one-percent). This led to a complete lack of interest and even when a company had a great bit of news, the impact was immaterial to my wealth, leading to further disillusionment. I came to the realization that I can create my own dividends through share sales, and that my goal should have always been to maximize total return. 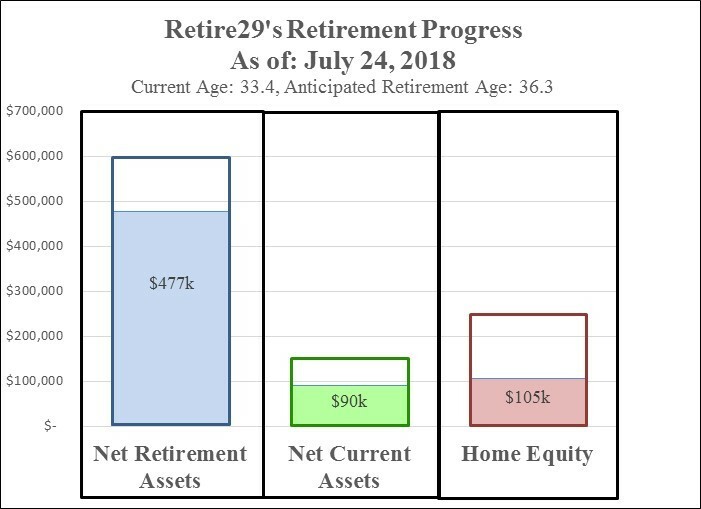 If you’ve been following the one aspect of Retire29 that actually stays updated, My Portfolio, then you’ve likely seen this portfolio evolution firsthand. I still own, as of today, 21 unique ticker symbols. I feel comfortable at this level, but over time I aim to get that down to 15 positions. Fifteen positions is still diversified enough to reduce most company-specific risks, and I feel as though it’s far easier to identify 15 stocks that will outperform than finding 30 stocks that will outperform (or 40, or 65). While a small sample size of ~3 months, the results have been outstanding (blue line is S&P 500, other lines are my portfolios. 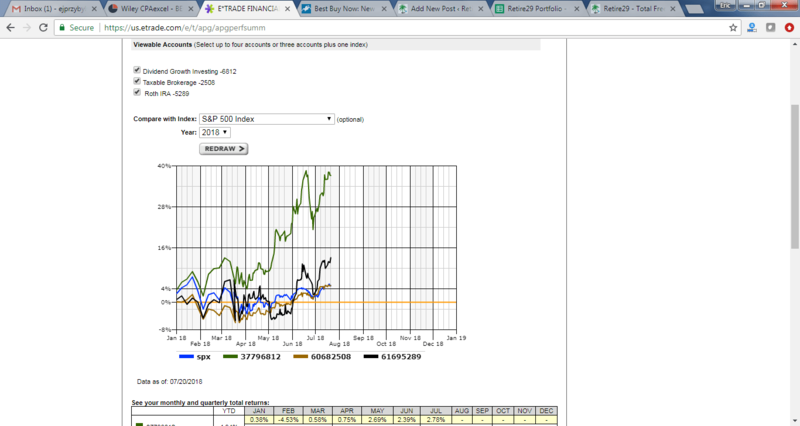 Green line is my largest portfolio). The results have not only been financially positive, they’ve been mentally positive, too. It’s exciting to follow the day-to-day movements of the markets. I, once again, actually read quarterly reports and listen to earnings calls. I know who the CEOs are and intimately know the product offerings. But, mostly, I actually get to see a material impact on my net worth when individual companies show movement. Digging back into the archives, I see that the last time I provided an update on my net worth, it stood at $546,559 on September 22nd, 2017. 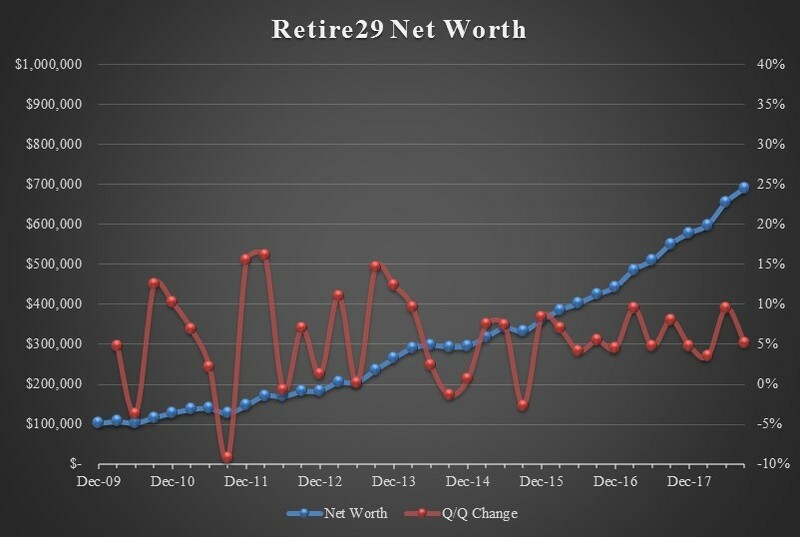 Since then, my net worth has climbed to $690,557, or a rise of 26% in 10 months. The S&P 500 has risen 13.5% over those same 10 months, for comparison. The increase in IRA balances is particularly impactful given that of the $72k increase in portfolio value, only $6k came from contributions. The rest is from, of course, good of principal appreciation. I suppose that’s it for now. I can only hope that this meager post gets me rolling again. But, if it doesn’t, feel free to drop me a note the Contact Me page. Your wedding gift, after reading this post, is laughable. And you call yourself my Brother!! How’s that free Netflix subscription workin’ for ya? I am an Anonymous troll. Not sure who is receiving your Netflix “handout”.